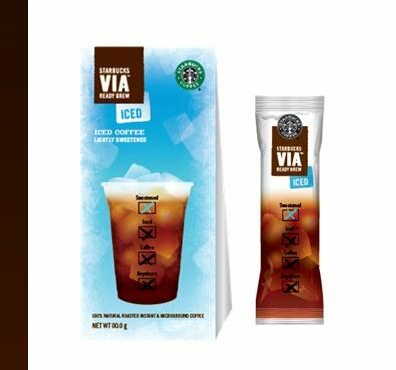 Yesterday, Melissa Allison of the Seattle Times’ Coffee City blog reported that Starbucks will soon be launching an iced coffee version of Via Ready Brew. It will come in slightly larger packaging than before, and it will be “lightly sweetened”. Melissa Allison‘s reporting of this helped me decide that the door was open to talk about this great new product which I’ve been hearing buzz about for months. I personally have not yet tried it (I had hoped that there would be a small pre-launch event that I’d get to sample it at, but as usual, that’s just my wishful thinking). One person I spoke to about the new Iced Via product, who indeed has tried it, described it as “Seattle’s answer the South’s sweet tea.” I’ve heard a vague rumor that there could later be flavor variations on this, such as vanilla. Per the Seattle Times, five packets of the new Iced Via Ready Brew will cost $5.95. I believe at some point during the R & D phase of this product they toyed with the idea of a four pack for $4.95, but there’s not a significance difference there. Basically, I CAN’T WAIT to try this and I wish Starbucks would get this out there. I already enjoy Via and in the summer last year, I thoroughly enjoyed Via mixed with sparkling water and drinking it like a coffee soda. Even better with Vanilla Dry Soda. The opportunity to have the Iced Via with a carbonated water or mixed with a Dry Soda (which would add a very mild flavor) makes me giddy. But as usual, Starbucks makes us wait and wait, and teases us for a long while before we get to try things. One more example, right here: They announce this a month before launch just to make us crazy. I’m sure I have a few readers who have sampled the new Iced Via. Please weigh in and comment if you have any opinions on Iced Via or if you have tried it! I have zero interest in Via. I am just absolutely not a target for that product and had no interest what-so-ever. It sounds like this will be a hit! Wow! Iced Via! This could be epic… I hope it hits US stores soon. But sadly, it will probably take a while for it to come to Canada. (VIA was launched in Canada only a few monthes ago). I look forward to your post tomorrow! LI am very excited for this product! Via has only been an addition to the world of coffee and a convenient iced version will simply continue to be used in new ways. Now if Starbucks would provide larger, scoopable portions I could find myself making even more magic! I am so excited to try this—I can’t wait! I would love to taste this Iced Via and see how it compares to the Terraza Blend that stores use for their iced coffee. I really like Terraza, and it’s not usually sold in stores in bean form, so I hope that this Iced Via is similar to that. Starbucks has clearly had success with Via to continue expanding it as an offering… Marketing a separate product for iced coffee is a great idea. Well played, Starbucks, well played. Don’t worry, one month isn’t a long time to wait. I must admit after reading your post I’m looking forward to its release myself. I’m so excited about this! When Starbucks released VIA, I thought it would be great if they specifically came out with a VIA for iced coffee that’s pre-sweetened. This made me laugh. “Seattle’s answer the South’s sweet tea.” As a native Southerner, I seriously hope that they do not try to market it that way. People in the South will laugh it off the shelves. I am not a Via drinker – and never will be – although I have tried it, and will try this concoction – but I am glad that they’re going into grocery stores. Via is a downmarket product, no matter what the minds at Starbucks corporate think. Putting the product in front of bored housewives and suburbanites who want to try Starbucks at home – even if there’s not one down the street – is a smart move. Because let’s face it, if city dwellers want a cup of Starbucks, they’re going to go out and get a Starbucks. Not crack open the Via. Wow! That sounds so cool! Great for the summer season…hope they kick it out very soon! Can’t wait to try this and great to see that VIA is a good success for the company…but they should release it everywhere. I’ve been waiting for Iced VIA for so long!! It’s much easier on the go and refreshing after a long transatlantic flight. It never occurred to me that a separate product would be needed for iced VIA. I’ve been known to throw 2 packets of VIA in a Dasani and shake away… it’s been my best conversation starter yet. Our coffee shop makes a cold brew coffee that never touches hot water. Much better than brewing a hot coffee and chilling it. 70% less acidity and very smooth. Makes a great ice latte or even as an add on in a frappé. @Al – Via can be dissolved in cold water. I’ve done this many times if you notice the above post. So you CAN make a Via Ready Brew iced coffee without ever having it touch hot water. I will say that I hate arguments that are based on SUBJECTIVE taste. It’s ridiculous to have any discussion about a certain kind of iced coffee being “better” when people may want or crave differing flavors. As to cold brew coffee, this is Seattle: Indy houses often do a cold brew here, and I’ve had it several times. Yes, it’s an absolutely refreshing summer iced coffee but that doesn’t make it “better”. It’s just a different flavor entirely from iced coffee brewed first as hot coffee, double strength so that it doesn’t weaken the flavor as the ice melts. On a hot summer day (or even not so hot), I also totally love an Iced Starbucks (Red) coffee, or an Iced Starbucks Yirgacheffe both from the Clover and both heavenly, with just a little bit of classic syrup. That is an amazing way to make an iced coffee, and it too has a flavor that I wouldn’t trade. Iced Via looks like it will be wonderful! Though in Seattle I imagine it will sell better in the Summer than any other time. Looks interesting. I still am a bit confused over this whole VIA thing though. I thought Starbucks was trying to educate the people on making coffee (plunger/filter/etc). Kind of seems like they’re admitting defeat with VIA. Am very curious about this iced version though. Yum yum! I can’t wait! Does it really dissolve well in cold water? Could I mix it with soy milk? What about putting it in a milkshake in the blender! I wish it would warm up here so I could drink chilly coffee without freezing myself! Brad – I don’t think Starbucks ever thought VIA would replace their regular coffee. The intent seems more to provide it to their customers so that when they can’t get into a Starbucks store to pick up a coffee they still have something comparable to drink. Kelly – It really does dissolve well in cold milk or water. I like your thinking about the milkshake…I’m going to try it in a Frappuccino this weekend. I have used Via in milkshakes and poured some Via (not the whole pack, just enough for taste) on ice cream as a kind of topping. Really good! I know you guys are all Starbucks fans, but I would challenge you all to expand your horizons and try an independent coffee shop who specializes in light roast coffees that are roasted fresh on a weekly basis. If you really like coffee, I am sure you will enjoy the experience of an independent who is passionate about their coffee. So has anyone heard when this might come to the stores or markets? AmazonV, where to begin. I own and operate an independent coffee shop and can tell you that from my perspective, Starbucks quality is only a few steps above McDonald’s. I agree with you that it is hit and miss with independents and would say that it is often a miss, however you should start the research because I believe you are missing an entire world of wonderful coffee shops. Many call it the Third Wave of coffee (Starbuck being the 2nd wave). The coffee world that I am in is so, so different. You can brew and make better coffee because it begins with higher quality beans that have been roasted within days of serving. Starbucks beans can already be 3 months from roast. I did read the link you sent and I must say there is much to disagree with, but perhaps this thread is not the proper one to discuss it. Let me point you to Intelligentsia coffee as a stepping stone to this “Third Wave”. They are the company who has produced the United Sates Barista champions the last several years (http://www.intelligentsiacoffee.com/ ). Also you see an excellent youtube video on espresso at http://www.youtube.com/watch?v=hEb1rXP3aTU in HD. 1. I fully believe that there is plenty of room in the coffee world for everyone – indy shops and Starbucks. 2. This isn’t really a place for never ending arguments where no one will persuade another to give up their favorite coffee. 3. If you’ve been reading my comments or following me on twitter, you’ll know that I thoroughly enjoy experiencing indy coffee too, as I am sure many of these participants here do. It is NOT a zero-sum game (cycling back to premise #1). It looks to me like you’re new to this site. In fact, there was someone who posted here from Trabant coffee in one of my old Clover threads (he dug up an old 2009 Clover entry) and I raved right back at him that it is a wonderful place to go for a cup of coffee. A person who genuinely wants to educate their palate WILL seek out more than one roaster. 4. This thread is about Iced Via. There are a few open threads here and there. @AmazonV – I’ve heard rumor that Iced Via is coming sometime in June, though it might be late June. Melody, this is your site so you can obviously run it as you wish. Yes, I am new to the site. Not sure how I found you to be sure. Anyhow, I am not interested in creating enemies nor fighting over coffee because they are obviously more important battles to fight over than coffee. I am quite thankful for Starbucks, because they have made it possible for me to be in business. They have for the most part created the market for me to fit in. Anyhow, it has been interesting. Goodbye. You’re not the only indy roaster to post on here. But you’re not going to really come to a blog like this and with a couple of posts persuade there is some superiority in your coffee. I wish you had read what Trabant Coffee wrote on this site. Prime example of 100% perfectly professional: I would encourage my Seattle readers to go have a cup of coffee at Trabant. Iced via arrived in my store today via our roasting plant order. Our shift supervisor unpacked it and said we were supposed to try it in the store and then the remaining packets could be taken home by partners. One case included six boxes, each containing five packets. Each packet of “lightly sweetened” via is for approx. 16 oz. of water. According to the back-of-box nutrition info (not on individual packets), one packet is two servings and (combined) contains 22 g of sugar. “lightly” sweetened — uh-huh. Anyway. I didn’t see it get ‘made’, but one partner’s comment was that it looked like pouring straight sugar into the water. It definitely tasted sweetened, but I like my iced coffee (the terraza that S’bux serves daily) with the classic syrup normally. To me, it tasted very similar to a sweetened (sans milk) iced coffee that one could order in the stores. So, I have a question: Why is there ZERO info on what blend this is????? It starts to sell tomorrow and we have been digging to no avail! I am sampling it to customers on Tuesday and find it unacceptable to not be able to tell them! The only clue is that is says “product of Columbia” on the packaging. It makes me think of how hard we had to dig to find out Tazo switched from silk to nylon when the full line of full leaf came out! I actually personally emailed them because it was really bugging me and I wanted an answer for my customers and they told me it was proprietary information that they could not divulge! well, I searched all over again and the ONLY info is in the sampling kit and all it says is that it’s Latin American. Although the packaging says “product of Columbia”. I still am not super happy not knowing exactly what it is!